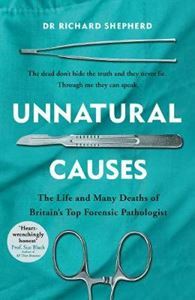 Meet the forensic pathologist, Dr Richard Shepherd. He solves the mysteries of unexplained or sudden death. He's a detective in his own right. How did this person die? Dr Shepherd has faced serial killers, natural disaster, 'perfect murders' and freak accidents, all in the pursuit of the truth. And while he's been involved in some of the most high-profile cases of recent times, it's often the less well-known encounters that prove the most perplexing, intriguing and even bizarre. In or out of the public eye, his evidence has put killers behind bars, freed the innocent and turned open-and-shut cases on their heads. But a life in death, bearing witness to some of humanity's darkest corners, exacts a price and Shepherd doesn't flinch from counting the cost to him and his family.